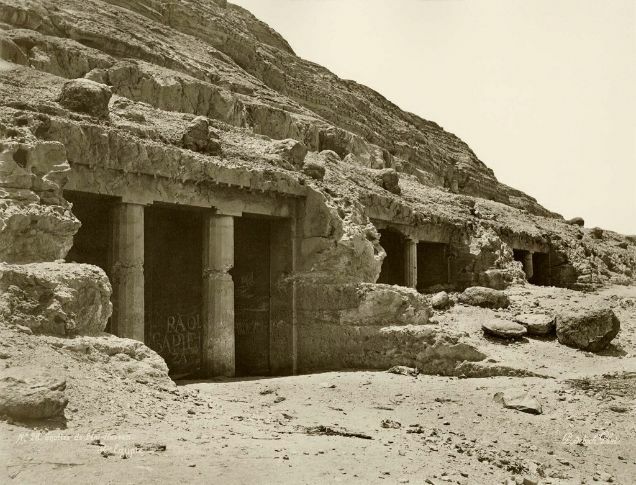 These tombs of Beni Hassan are amongst the oldest monuments of Egypt . . . yet exhibiting, in the liveliest manner, hunting, wrestling and dancing, and curious as showing how gay and agile these ancient people could be, who in their architecture and graven sculptures appear so solemn and immoveable. Except a doubtful figure of Osiris in one, and a mummy on a barge in another, there is nothing of death or judgement here. We reached the Grottoes at last. They are cut along the side of the hill, at a distance of about two miles from the village. Those to the south pleased us extremely. They are of the oldest style of Egyptian architecture, and very elegant. The columns represent four stems of water plants, supporting a capital in the form of lotus or papyrus buds. The transverse section of these grottoes is very elegant, and the architecture resembles a depressed pediment, extending over the columns, and resting at either end on a low pilaster. The simplicity and elegance of the style and device strike the eye at once. The walls of all the grottoes are covered with various interesting coloured devices. In 1930, Mary Chubb accompanied an expedition to Egypt to investigate and excavate the site of Tell al-Amarna, city of the ‘heretic’ pharaoh Akhenaten and his wife, the beautiful Nefertiti. Her description of the lifting of a heavy stone might have been given at any time throughout the millennia.